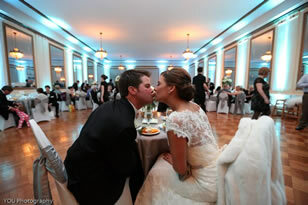 Turning an ordinary room into an extraordinary room can create the “WOW” factor at any event. 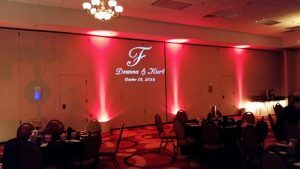 Uplighting gives your reception the dramatic appeal that will have your guests talking about YOUR event for decades to come. Add class, elegance and a personal touch to your event. Select your favorite image such as pictures from your event theme such as hearts, doves, and stars or select a custom message such as the name of the guests of honor, a business logo, or other design of your choice. These images or messages can be projected on the wall, ceiling, or floor creating a unique ambiance. Everything was EXCELLENT. . . We couldn't be happier. It was perfect. Family members were even impressed with the quality and setup. . . Thank you, thank you, thank you!"